Addresses are not on the document. They are printed on the outside of the envelope only. Each recipient envelope contains the exact same documents. 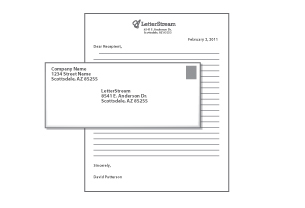 #10 (standard business size) envelope without windows, custom printed with you recipient address and return address. Return address logo and endorsement line printing are optional. Addresses are on the document. 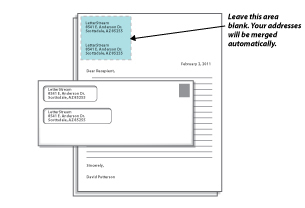 #10 (standard business size) envelope with two windows for document content to show through. Our mail making tools have so many options, the best way to sort through the pieces and options is to simply get started. Decide which letter type best fits what you have and click Get Started. Pricing Options -- So Many ! Add $.06 for additional side black and white printing. Add $.12 for additional sheet with black ink on one side. Add as many sheets as necessary.